Water games, sweet iced tea and lounging outside are just a few of the ideas that come to mind when thinking about summer! The kids are out of school, the smell of backyard barbecue is all around and the lull of the warmer months draw friends and neighbors out to socialize. But before you send out that neighborhood block party invite, is your backyard ready to entertain? If not, don’t fret! There are plenty of ways to spruce up your yard by using easy things like garden furniture made from pallets that will keep you and your wallet happy! All you need is a little creativity and willingness to put in some elbow grease, and you’ll be backyard party ready in no time! Check out our awesome list of DIY pallet garden furniture ideas to get the creative gears going and the lemonade flowing! 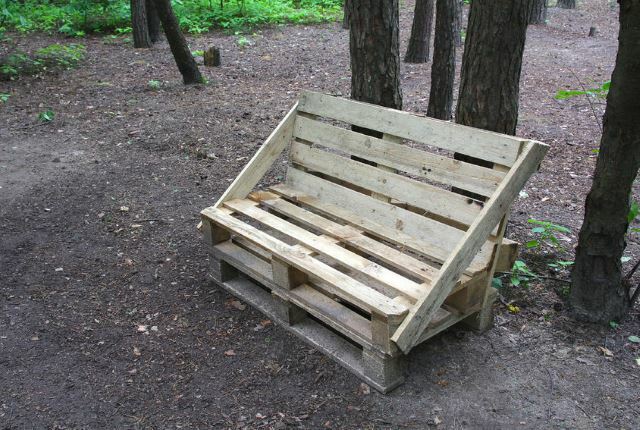 Take an ordinary wooden pallet and turn it into a rustic-looking bench! Wooden pallets are relatively easy to find — any hardware or home improvement store should have some in stock. Most places will just throw these away, so the odds of you snatching one for free are good, but if not, they won’t be very expensive anyways. Add a little paint and let your creativity soar! Grab some extra 2 x 4’s and make a solid wooden chaise lounge! If you don’t have any extra 2 x 4’s on hand, a neighbor probably does or you can purchase some for cheap at a local lumber yard. Not only are these incredibly cost effective, but they add an interesting addition to any backyard setup. Throw a decorative outdoor cushion on there and you’re practically Martha Stewart. The possibilities are endless with wooden pallets! 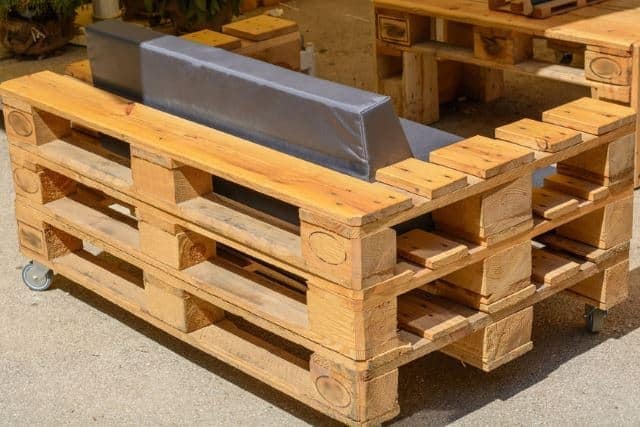 With two to three pallets, you could easily make a whole set of interesting backyard furniture that definitely won’t break the bank. Simple loungers, a funky table and even a hanging plant holder or garden can be constructed with ease. All you’d really need is a little creativity and some hammers and nails. Here’s another idea for furniture using pallets perfect for under an awning or covered patio area. Using a little bit of a deep, dark wood stain will add some extra character to the wood and make your backyard scenescape pop. If you don’t have stain on hand, any extra paint will do the job, as well. Just make sure to let these dry way ahead of party time! 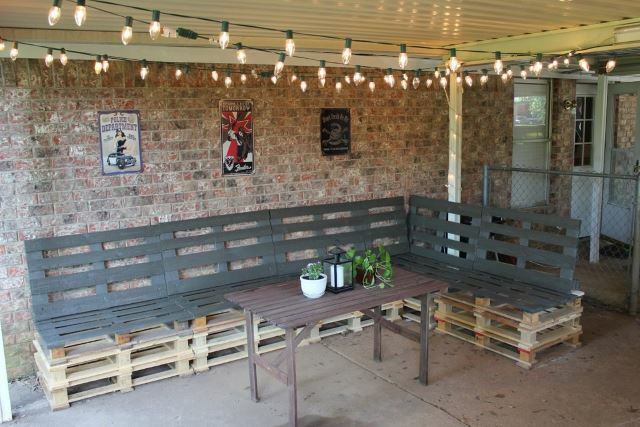 Make the most of your space and get your patio ready for big hangouts by utilizing multiple pallets to create booth-style seating. This DIY pallet garden furniture is stylish, affordable and totally customizable to fit your outdoor space needs. You can measure and cut your pallets depending on what measurement and height you need to make your patio party perfect. Here’s a DIY for wood pallet garden furniture that gives you a step-by-step process. The table and chairs are finished with a pine stain that gives the furniture a polished, classy euro look. 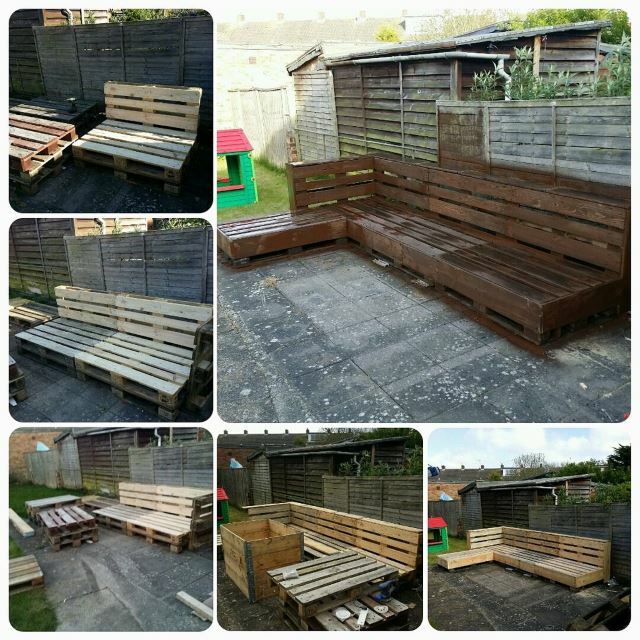 Even the process of transforming these old pallets into garden furniture could be a fun activity for the whole family! Just leave the hammering and cutting to the adults. This nifty instructional video demonstrates exactly how to transform an old wooden pallet into a reclaimed coffee table. A table like this would be perfect outdoors on a patio or even in a screened area to enjoy some early morning coffee. 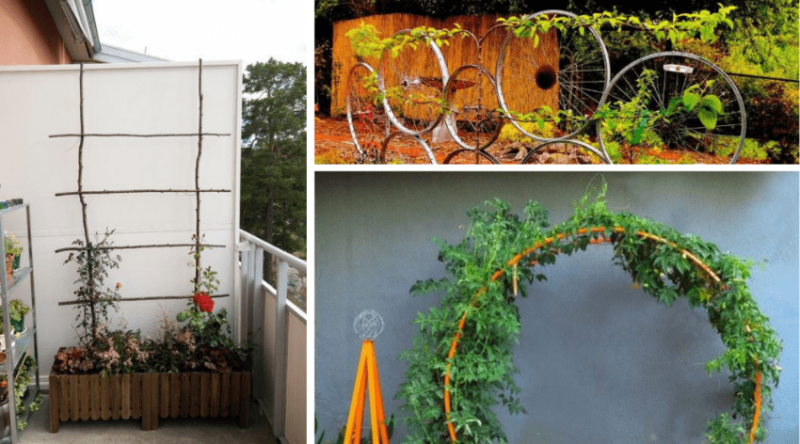 This is a great, simple project without the need for any expensive materials and an extra bonus – it doesn’t take long at all to build! 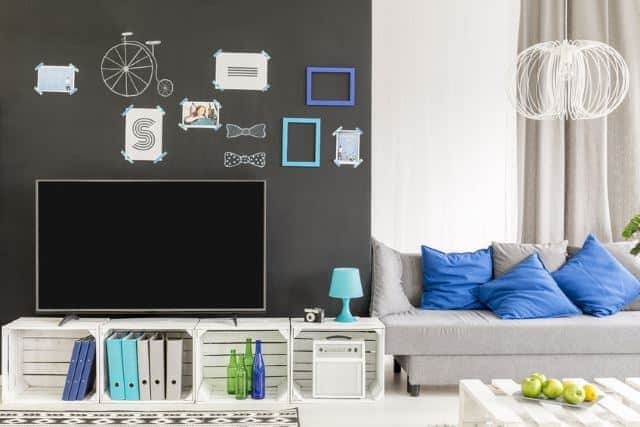 Here’s a super creative idea if you’re willing to spend a little extra time (and money) on an indoor project. Using old wooden pallets, you could refurbish them to make a bed frame and headboard. In this picture, stones are used to decorate the headboard to create a boxed-in effect that is truly unique and actually beautiful. 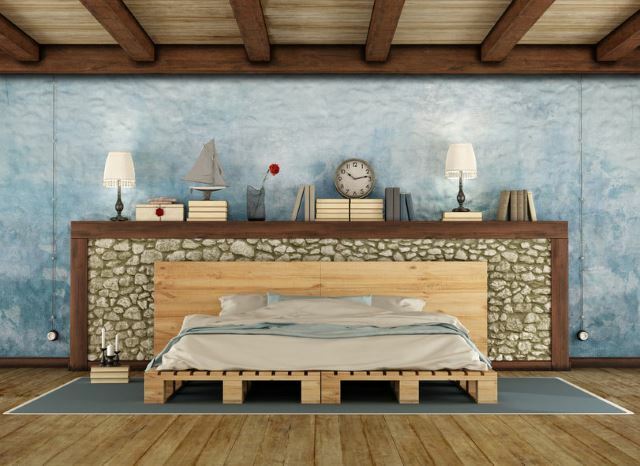 Using wooden pallets in place of a traditional bed frame adds a rust sort of feel to the room. Here’s a DIY YouTube video for a pallet bench. The process calls for simple materials you could find at a home store, or maybe stuff you even have laying around. The wooden pallets are cheap to buy if you can’t find any laying around lumber yards or stores. This video states that the whole project cost just under $25. Seems like a great project that will keep your bank account happy, too! 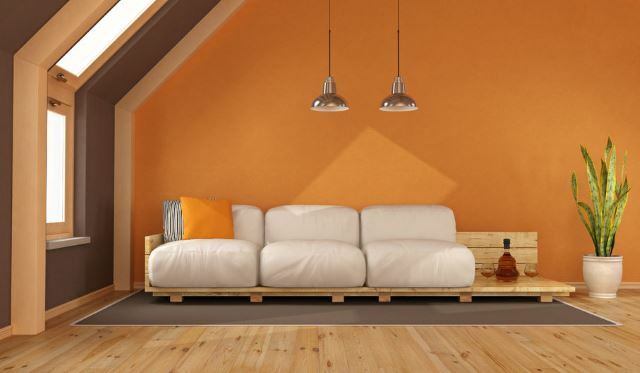 A pallet sofa is a truly unique way to tie a room together! This image depicts a relatively simple wooden pallet framed sofa with plain, white sofa pillows for décor. Depending on the type of cushions you prefer, you could easily use a cushion made from materials suitable for outdoor use. 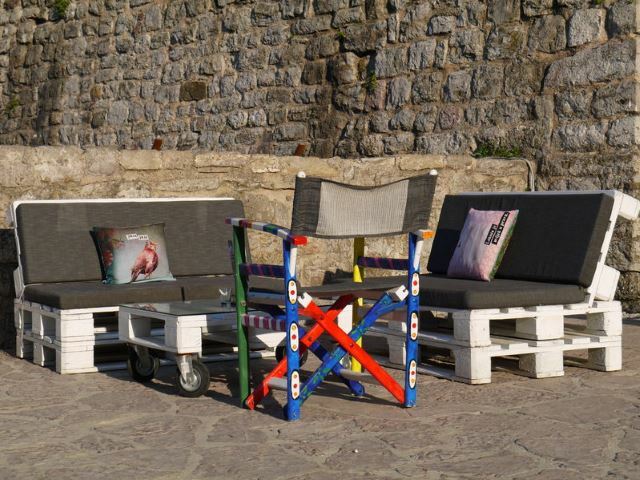 A garden sofa made from pallets wouldn’t be complete without the pallet garden furniture cushions! 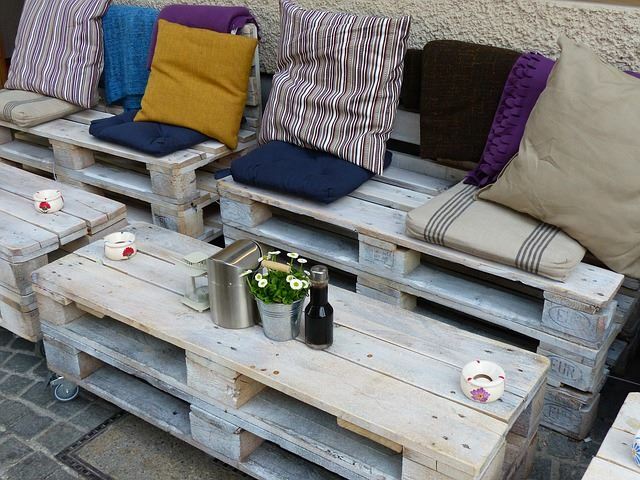 Here’s a perfect example of how great homemade garden furniture from pallets can look. Paired with decorative outdoor-safe cushions, the wooden benches and tables will transform your outdoor into a rustic café. Or at least it will look that way! The wooden pallets used in the photo are raw, meaning no stain or paint was added. Stained or raw, the wood looks great. Here’s an image to guide your pallet garden bench plans! The scene almost resembles something you’d find in an artsy park. 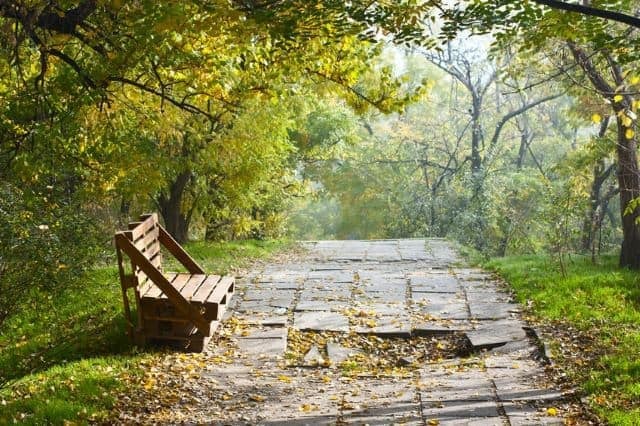 You could make these wooden benches and tables as fancy as you’d like, but even keeping it simple will make your garden area look incredible. It seems that white paint was used on these wooden sets, but again, paint is optional. Similar to the previous image, this scene gives a closer look at the wooden pallet garden tables. Wooden pallets can be stacked as high as you’d like to create a taller or shorter table. The tables could be decorated with a fancy tablecloth and some votive candle holders if planning a party or reception. Outdoor weddings will never go out of style and these wooden bench and table sets would be a perfect addition without the extra expense to a wedding. 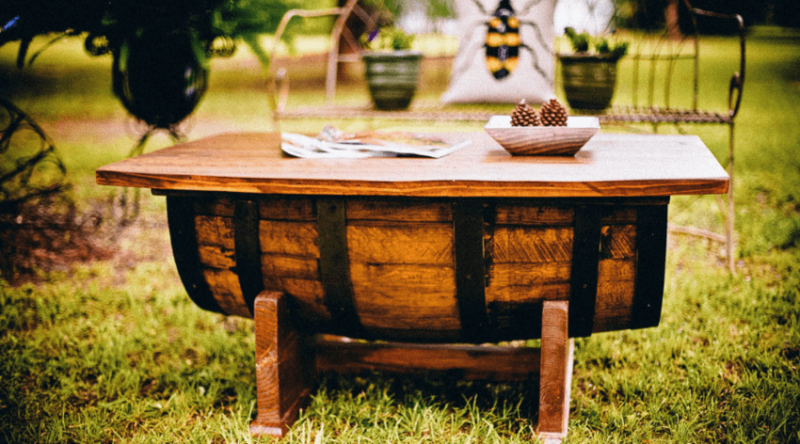 Here’s a great idea – add wheels to your wooden pallet garden coffee table! With this small addition, your wooden furniture could be moved around easily. You’d want to be sure to get the wheels with stoppers so that the furniture wouldn’t be moving around incessantly. Add some varnish and sealant, and you have some high-quality looking furniture that will last! Since wooden pallets are so easy to use and cheap to buy, utilizing them to create a whole living space is a great idea! The pallets could be used as a coffee table, sofa and even crates for records or other items. Depending on the color scheme of the room or outdoor area, you could easily paint the wooden pallets to match any sort of theme. Got a small business or work space? Wooden pallets are a unique way to liven up the office by creating chairs, tables or desks to work on. Even better, they’re so cheap! (In price, not in quality.) This is a perfect way to step outside that stuffy office feeling and add a bit of fun to the work area. Here’s a perfect example of a customizable coffee table or pallet garden furniture bar. You can get as creative as you want with the size, shape and color of these nifty furniture ideas. Save money on shelves, too, by creating your own by using pallets. The white paint on this coffee table really pops and adds personality to the entire room. Here’s an entire room with furniture made from wooden pallets. The space has a wooden pallet coffee table, shelves and even possibly a wooden crate couch frame. Wooden pallets could also be draped with fabric, so if you did create a frame for a bed or couch, it could be easily draped with decorative fabric to add some more personality to a room. 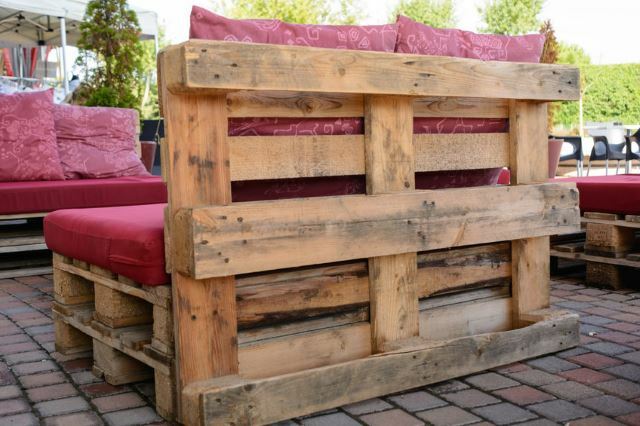 This photo shows how you can use pallets to create a perfect pallet garden corner sofa. You can keep that rustic feel to any of the furniture by leaving the wood bare. 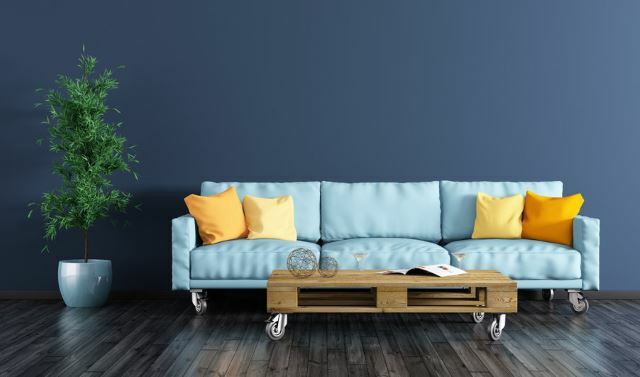 If you don’t use a sealant, however, be sure to have your furniture in an area it can’t get rained on, or at least set it up where you could easily move it if needed. 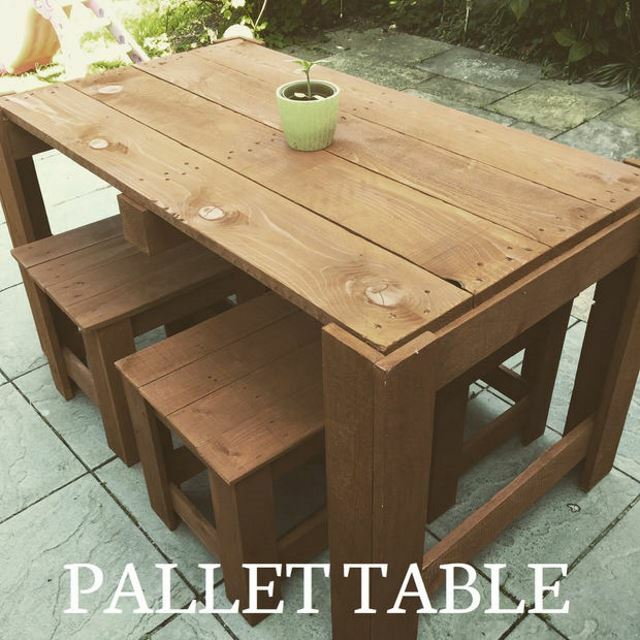 Here’s an outdoor pallet furniture set that comes with two chairs and one table. 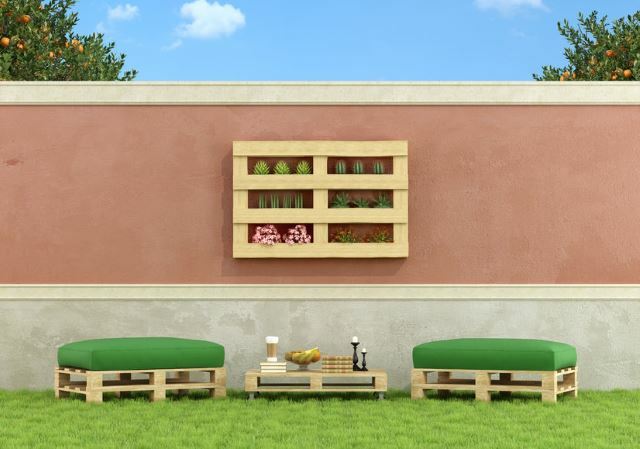 These customizable outdoor furniture sets would add a cute addition to any outdoor garden setup. The chairs would be perfect for lounging around during a warm summer evening or even cuddling up to look at the stars at night. 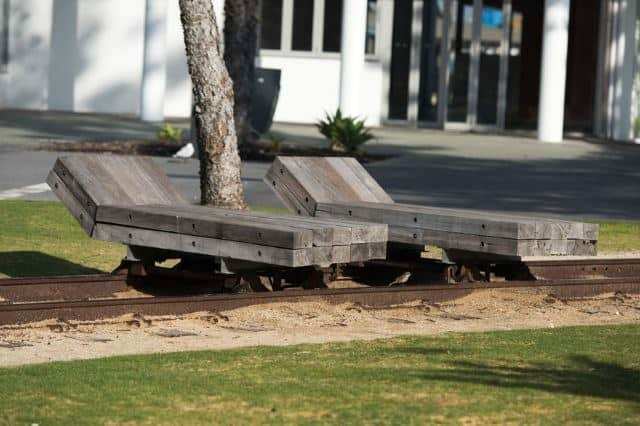 This is also a great way to recycle any old wood lying around. 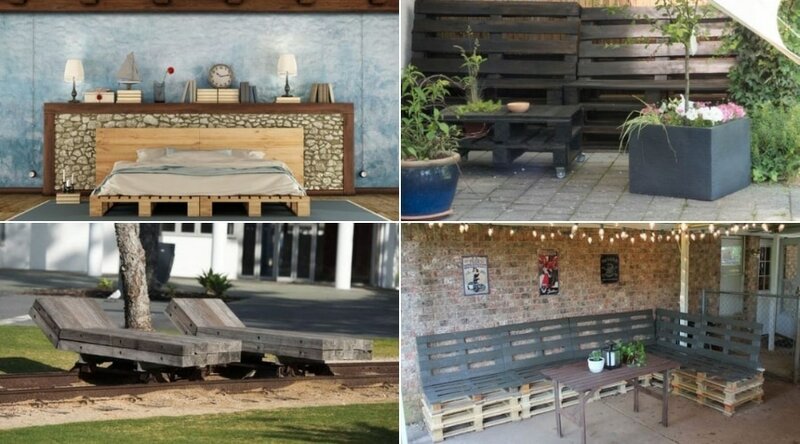 When upcycling wooden pallets, the possibilities are endless when it comes to furniture. This wooden pallet couch has arm rests that could double as a small side table. This couch would be perfect for sipping lemonade in an outdoor garden area. 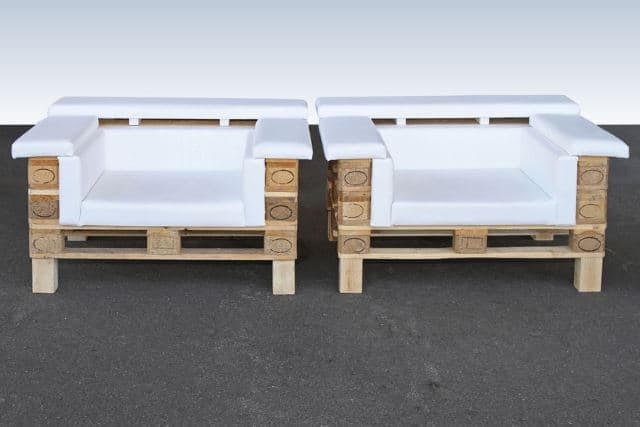 Or, in the cooler months, these couches would look great surrounding an outdoor fire pit. Customize the couches to fit your needs. I love this idea! 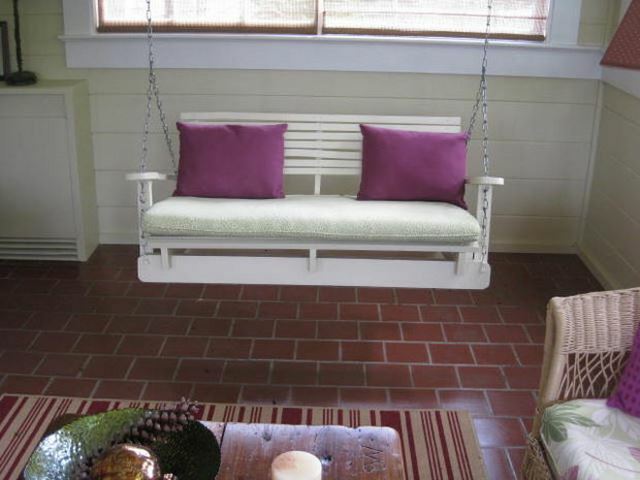 Create an outdoor (or indoor) wooden pallet swing chair. The process is easily customizable and adding the chains to the chair is a simple, extra step to create something truly unique. Adding an outdoor-safe cushion would really tie the whole furniture set together when pairing with outdoor chairs, couches or coffee tables. If you don’t have chain to use for the swing, purchasing some shouldn’t cost that much. 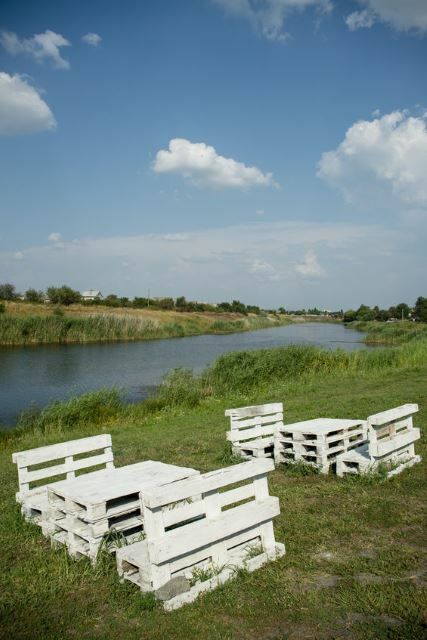 These wooden pallet arm chairs will add some creative flair to any pallet garden furniture set. Adding some upholstered cushions should be an easy process and adds an extra bit of swankiness. 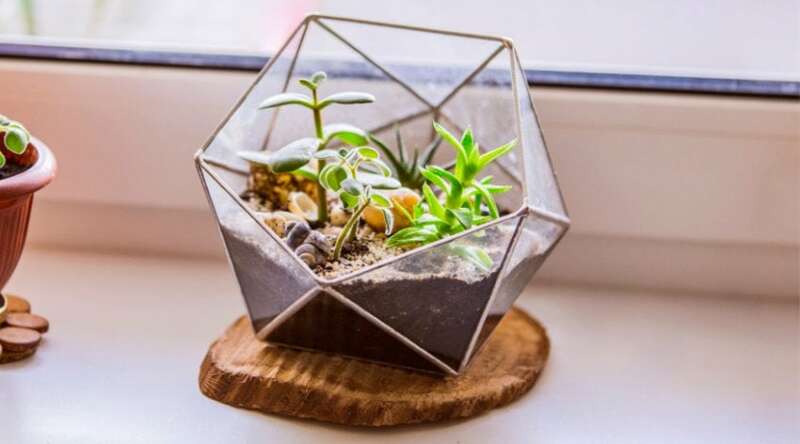 Setting these up on a patio space or in a garden area will no doubt impress guests and they look much more expensive than what they’d really cost to make. Here’s a great outdoor patio furniture idea that would be great for kids, too. Adding different colors will make your outdoor area a super fun place for kids to hang out during those long summer days and cooler nights. You can easily make these double-backed chairs since wooden pallets are so easy to work with. For extra fun, let the kids pick out the paint colors. 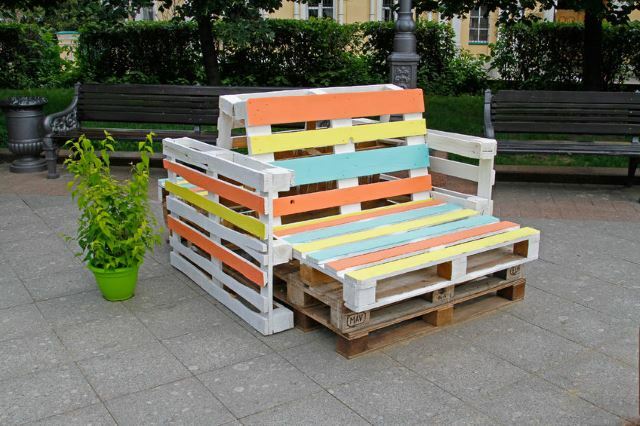 Here’s a great idea for bringing some pallet furniture to life. This three-part bench is painted a bright, solid white and utilizes plants for a creative cushion. Add the stylish pallet table painted in the same fashion and you’ve got yourself an innovative, environmentally friendly garden seating area that blends in with the landscape! This great step-by-step instruction will help you create the perfect pallet garden corner sofa. What’s great about using the pallets is that you can make these sofas as long or short as you’d like. You can easily cater to a small, family living space or a cool outdoor party hangout. Once you figure out the number of people you want to create a space for, you can use the wood accordingly. 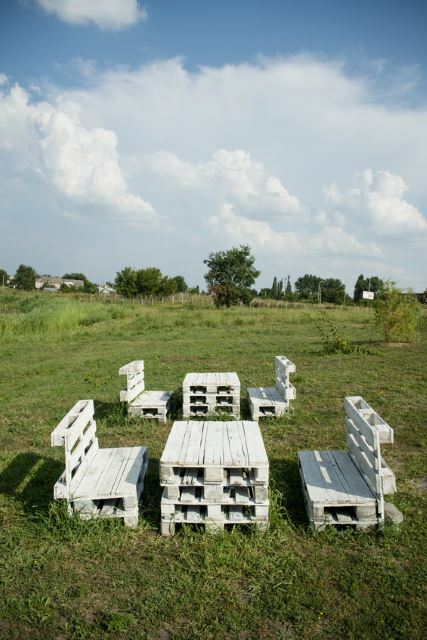 Recycling old wooden pallets to make outdoor seats and tables is a great way to save money and help the environment! These simple chair and table sets are totally customizable and would even make the perfect gift for a close relative or friend. The fact that the furniture is homemade is much more special than anything bought from a furniture store. This upcycled wooden pallet chair gives a rustic feel while creating a completely modern furniture space. 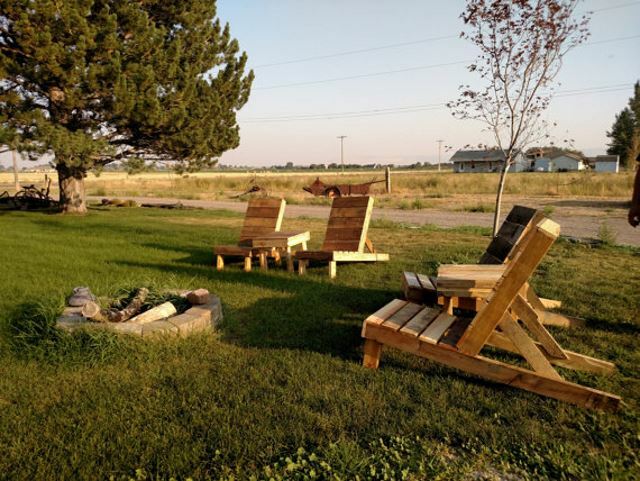 Homemade garden furniture from pallets will no doubt become the new trend as more and more people are realizing the possibilities with these materials. The fact that most of the materials to create this style of furniture is either recycled or cheaply purchased is even better. Whether you have a lot of outdoor space to fill or just want to create a fun patio bench, using wooden pallets is ideal. 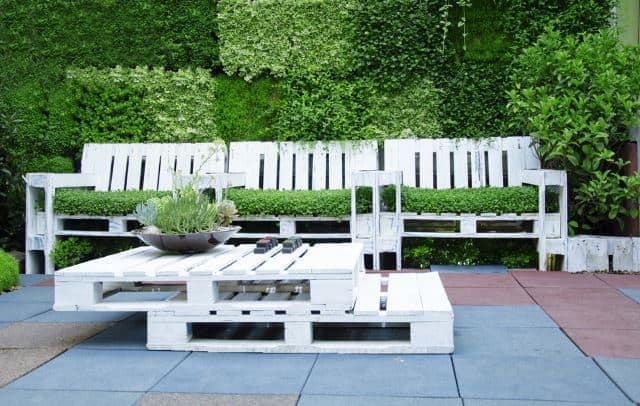 You can create these simple benches from wooden pallets and give them decorative flair by using paint or creating outdoor cushions. Whatever you plan to use them for, guests will be impressed and you can brag about them being homemade. This is a fantastic idea for creating a pallet garden furniture bar. What could possibly be more impressive than having your own outdoor wine bar? Having created it yourself, of course! 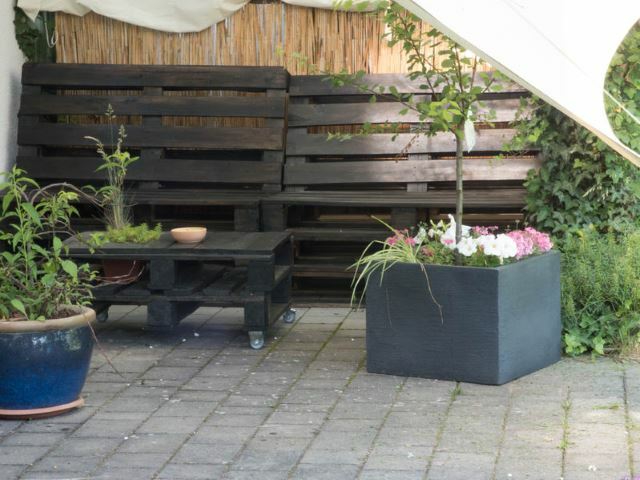 This outdoor wine bar created from recycled wooden pallets would be the perfect addition to a garden party and guests will no doubt be completely impressed! The bar could be as fancy or as simple as you’d like. 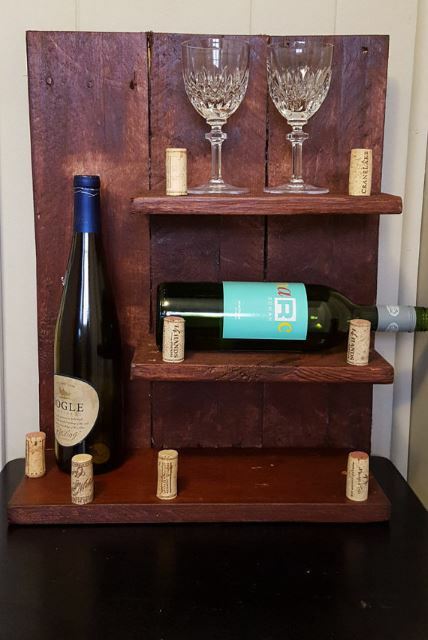 Use a wooden pallet to create an interesting, completely handmade wine rack! 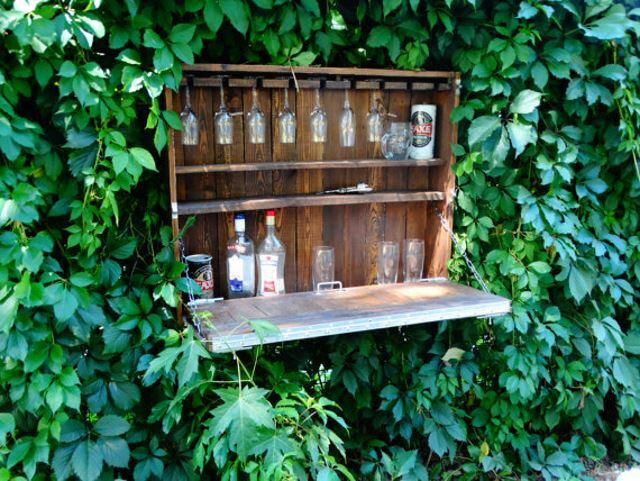 This would make a great gift or fun addition to a pallet garden furniture bar. You could even use this indoors for an interesting addition to a kitchen or man cave. Depending on the finish, you could make this as rustic as you’d like. You would just need some paint or stain to complete it. Here’s a great picture of a bar completely using wooden pallets. 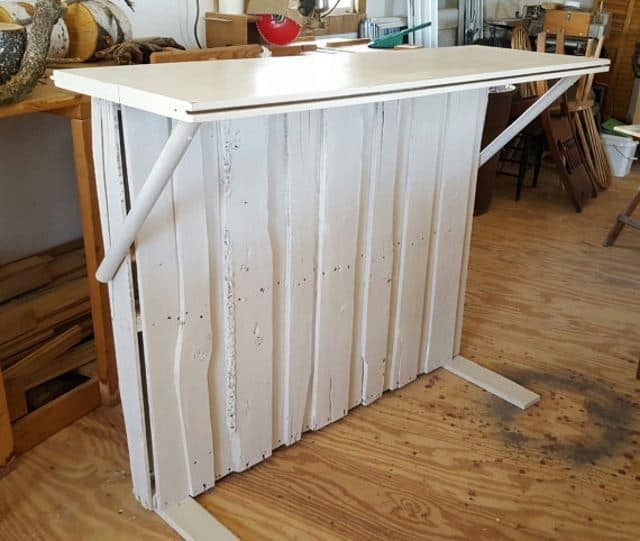 This would be perfect for a patio bar or outdoor kitchen area. Imagine the great parties you could have with the accessibility of your own, custom made outdoor garden bar? Not only would your guests be impressed, but you can use the bar area for many occasions. Cheers! Imagine owning your own outdoor beer bar? It can totally happen! Customize your outdoor wooden pallet bar by designing it with the specifications you want. This design features a tap installed into the wooden bar for beer kegs. 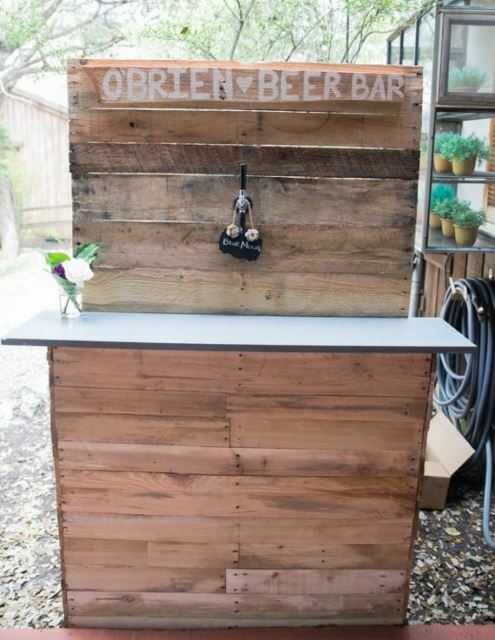 I can’t imagine a better patio party without a customizable wooden pallet beer bar. 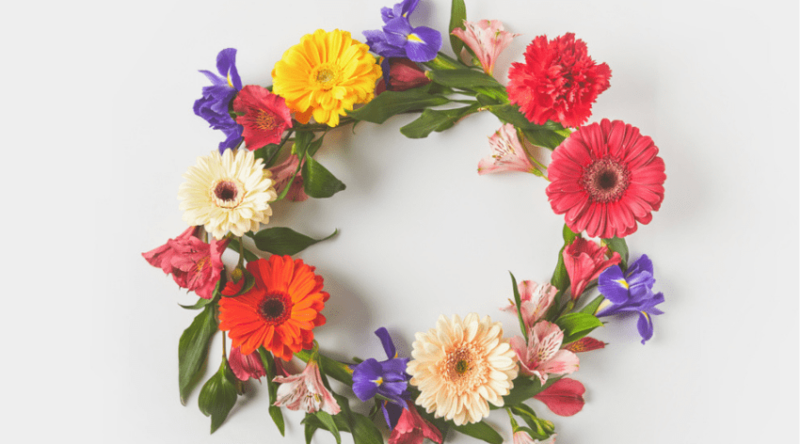 This would also be perfect to create for a specific event like a wedding or birthday party. It’s easily stored and can be brought out when the occasion arises. 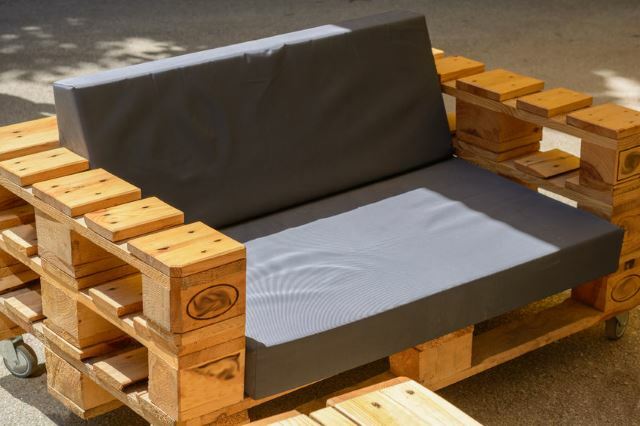 Hopefully some of these great ideas will inspire you to create your own customizable furniture by using wooden pallets! There are so many ideas and ways to utilize them, and finding wooden pallets should be generally easy. A lot of these activities would also be a great way to involve the whole family in creating handmade furniture. Not only would it be a fun process, but you can be proud of recycling and repurposing old wood to create completely unique pieces. 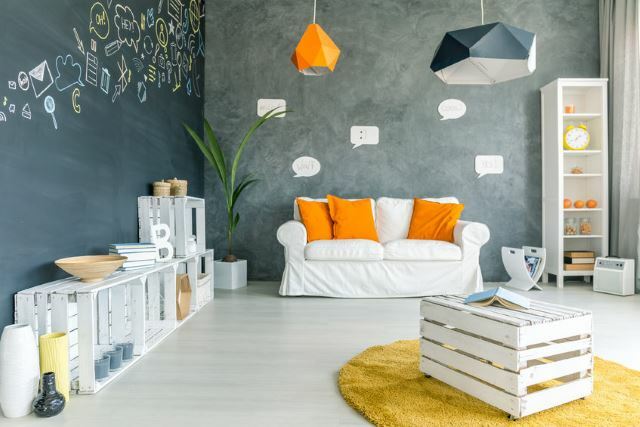 Whether it’s an indoor living space or an outdoor bar for a party, the materials needed would be relatively cheap and you can make it as fancy as you’d like. 40 of The Best Snow Sculpture Ideas: #27 is So Cool!